10 Beginner Camping Mistakes: tips to make camping easier! We were all beginners once...and I think everyone has made a mistake or two on their camping adventures. Camping doesn't need to be complicated, and it's not rocket science, but as a beginner it can be a little overwhelming leaving your comfort zone to try something new. That's where we can help you. Below are 10 mistakes you can make when new, and tips on how to avoid them (or at least minimise the chances of them happening). 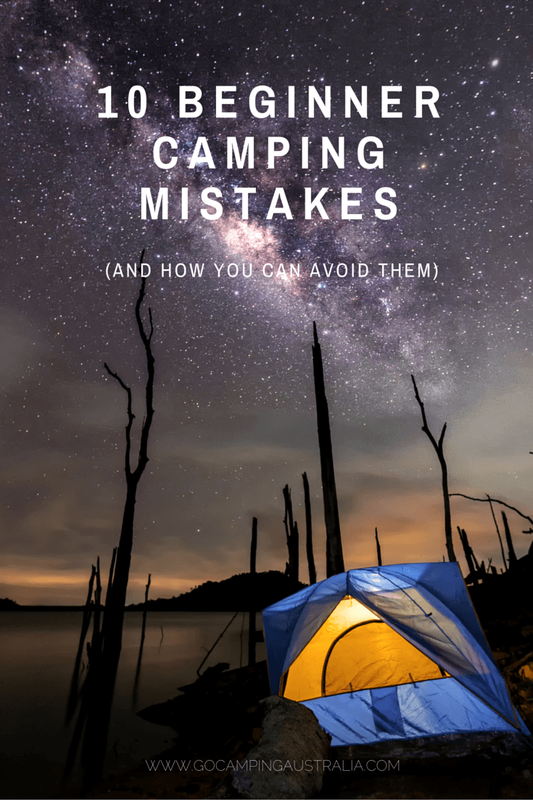 There are lots of lists on the internet about camping mistakes, and incidentally, a good proportion of them are plagiarised from this very page you are now reading. So, congratulations, for choosing Go Camping Australia as a starting point. And apart from the 10 beginner mistakes on this page, we also can share with you ﻿8 camping fails﻿! (read that story to see where others went wrong, and how you can make sure your camping trip, isn't classified as a "fail"). FYI: If you like your tips visually, watch our Slideshare Presentation below at the end of this story. Camping is meant to be relaxed and fun but it will not be that way if you are not prepared for where you are going. Read up on where you are going, conditions, weather and facilities (water, toilets, campsites). Spontaneity is all well and good when camping, but a lot of effort can go into getting you from A to B, so take the time to ensure that you give yourselves the best chance of having a good time. This becomes more important if your time is limited for the camping trip. A little bit of homework in the beginning is an important part of your camping trip. It doesn't have to take hours, but a quick look at some websites, a phone call or email, might just help your camping adventure start off more smoothly. Suggested sites to investigate about your desired camping location (apart from this website) include the relevant National Park authority for your state. This is a worthwhile starting point because they can give you information on booking your site (if applicable), road closures in the park, and campground closures. Some parks are closed due to seasonal weather activity. If you are seeking a caravan park camping location, then ring in advance and find out costs and availability. Some locations at peak times will be booked up months ahead, and if you haven't planned on this, you could find yourself wandering around for another campsite, eating up your valuable holiday time. Put your tent up at least once in your backyard. Work out how the stove operates. Nothing worse than getting to a campsite, and finding out that whilst it looked to be a basic piece of equipment, you actually need to be a Rhodes Scholar to operate it. Or worse, it doesn’t work at all, and that piece of equipment was crucial to your cooking!! It's OK to be a novice at camping - everyone was once - but reading instructions at the campsite on how to work something for the first time is not ideal start to your trip. You don't want to be relying on instructions that could fly away or get lost just when you need them. Trying your equipment out in advance, in the comfort of your home is really important. Apart from knowing how it all works, it stops you looking like a total beginner camper (we have a few tips also on how not to look like a newbie camper). Camping equipment for new campers - what sort of camping equipment should you take? Campfires are a wonderful part of camping, and a highlight for many people. 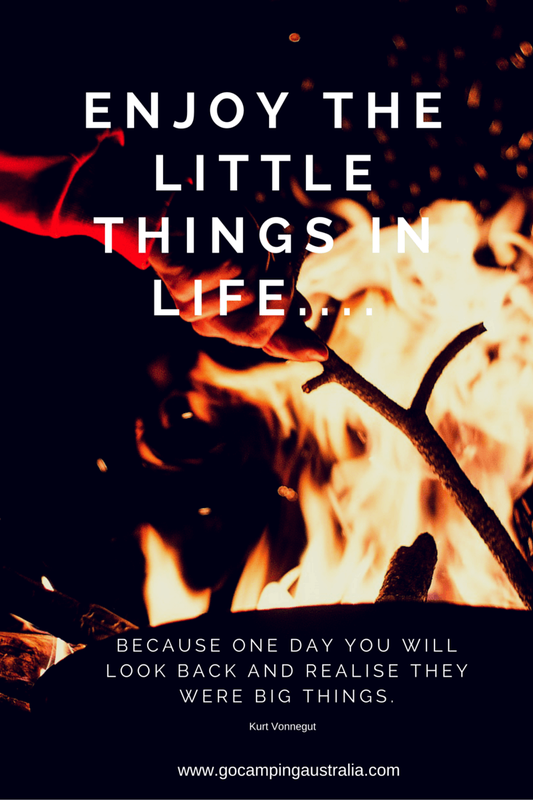 But as a beginner to camping, it's worthwhile knowing a few things before you plan on every meal over an open fire. Campfires can take a while to build up sufficiently for cooking. To put a Camp Oven in the coals, those coals need to be very hot and that takes time. Great when you can do it, but if you are pressed for time and don’t have the commitment to getting that fire set well in advance of dinner, consider having a back up plan. Also the time of the year can dictate if a campfire is allowed. Not sure? Then check in advance of the trip. Your local fire authority website will have information on the fire bans. And if you do get that campfire going, make sure you know how to put out a campfire safely. If you aren't 100% sure, then read "How to put out a campfire properly". A back-up to a campfire is highly recommended if you have decided that a campfire is a MUST! Camping recipe that uses a stick (no fancy equipment needed!!) Here are a few recipes that just need a stick and a campfire. When we started camping, we chose cheaper items because that is what we could afford at the time. But we have since had to upgrade much of that equipment because it wasn’t really suitable for camping more than once a year. Or, just when we really needed this piece of equipment, it fell apart or didn’t do what it was meant too. Totally understand that you can't always go with the elite camping brands but do look at them, especially in sales times. If you can, try and buy a quality name brand with good guarantees and after sales service. That extra money at time of purchase could save you a lot more down the track. See next point. Hopefully you will heed Point 4 above, and choose quality items. But in saying that, don’t go crazy and spend a lot of money on all sorts of equipment in the beginning. Firstly, you have to find out if everyone loves camping and want to continue to go (otherwise you have a garage full of expensive unused items). Read 10 pieces of camping equipment you need to get an idea of some basics. That list covers some key items to think about purchasing. This list contains some major things you might want to look at for initial purposes. Secondly, it takes a few trips to work out what you do need and don’t. Take your time and purchase quality necessities not luxuries. Our Porta Pottie was a luxury item, but in my view, also a necessity with young children. But we didn't buy it on the first trip! In fact, it came months after our camping trips commenced in earnest. There are lots and lots of camping checklists around on the internet, and some of them have so much gear on them, its amazing anyone leaves home. Use them as a guide, develop your own once you feel like camping is something you want to try more of, and want to buy gear. If you have friends who are campers, then you might want to hang out with them for a while, and use their equipment - taking advantage of their knowledge as well as their gear. Here is a reader enquiring about the purchase of a Porta Pottie when they are new to camping. Good purchase or not? Wrong bedding is going to make your life miserable. It did for us. See why air mattresses are not any good here. Don't make our mistake and shiver in your tent! It's a big camping mistake and can easily be avoided. How to avoid being cold? You are going to have to think carefully about the weather conditions you will be sleeping in, your own body temperature (eg. are you a cold sleeper or warm sleeper) and then buy appropriately. Do read up on choosing the right gear for you. Don't rush in and buy something without a little bit of thought and knowledge, or you may end up with gear that won't suit you and your camping style. We have a number of helpful guides listed below which can help you make some choices about this vital camping gear. Plus, if you need more help on staying warm in winter, read our easy tips to surviving winter camping. And remember, that in some stores, the sales staff will try to sell you camping gear that they have in stock, which may not necessarily be the right choice or gear for you, so going to a store with a bit of knowledge will help you not be swayed into buying something you don't need. How do you choose a sleeping bag? How to choose a self inflating mat here (and get the terminology explained too). Turning up late at a campground, looking for an unoccupied space and then when and if you do find a place, having to set up and feed everyone. It is stressful for all. The children may be hungry or they just run off into the dark unknown, thrilled to be released from the confines of the car. Or you have no idea where the toilets are (if they even have any – once more, hope you have done your research as listed in Point 1). I don’t recommend late arrival at campgrounds as a harmonious start to the trip. We have put together some tips on what to look for when you do get to your campsite, and reading this in advance of any trip, might just give you a bit of confidence. There is nothing worse than a long trip and then driving around and around a campground looking for a spare spot as the light fades (or its pitch black) to appear miraculously in a peak time. In some campgrounds, you can only camp at designated spots; if they are full, you will have to leave that campground, and head off somewhere else. In the dark, this is something that no camper wants to have to face. Arrive early and have a back up plan if the campground of your choice is full. Peak times (long weekends, Easter) many campsites will be full prior to the holiday even beginning. Campers who have arrived at campsites early in the day, will not take kindly to you, in desperation, trying to fit into their campsite at night time. It's happened to us: people turning up at 9pm and finding no spots left, and then barging their way into our campsite and wanting to "share" a limited area. To give you a bit more advice about what to expect when camping at peak times, we suggest you also read our camping at Easter tips, because it covers this problem and a few more that you can expect if you are not ready for busy camping. Arriving late at a campsite is one big mistake at any time of the year. We started out camping adventures with headlamps and hand held torches, because, we were going to have the moon and the campfire to shed light!! That illusion was shattered fairly early on, when it was time to prepare a meal and we had weak headlamps and as for torches, how do you use one of them plus do all the meal prep? We looked around at other campers, with their sites lit up like the sun and had experienced for the first time........lighting envy. That was it – next trip we had our battery powered lanterns (and have progressed from there to quality LED Lenser headlamps, LED lighting (doesn’t shed a wide light but a powerful directed light) and fluoro lighting (charged via our battery). You can't have too much lighting. Headlamps are a must regardless of what sort of lighting you use elsewhere in camp. If you aren't sure about choosing a headlamp, then read our story as it will give you buying tips, so you will have lighting! Don’t underestimate the importance of being able to see around camp easily. Tripping over ropes, branches and rocks is not fun and you don't want an injury at the start of your trip. Come nightfall, and a quiet campsite, and you will get nocturnal visitors that you had not thought about in your camping adventures (and didn’t read about in the brochures). Foxes and possums and kangaroos are all ones we have encountered attacking garbage. We have woken to find the contents of the day’s garbage, strewn across the site. We quickly learned from that, and now lock up the garbage and sometimes put it on our roof rack. Hanging it high from a tree did not deter a fox at Deep Creek Conservation Park (South Australia), from jumping up and pulling it down. If they don’t get to the garbage, they will try for your other food, so put it ALL away, and in lock up plastic tubs. In the USA we knew that bears would come looking for food, but we forgot about our own Australian animals and their love of food! Naturally, when you leave the campsite, you will take all the garbage with you. Leave no trace. Yes, it can be a pain to put a smelly full garbage bag back in the vehicle with you, but please do so. Dispose in a bin outside the park. Not sure about leave no trace principles? That's OK because you will now! ! Please read our ﻿4 tips on how to keep your campsite clean. ﻿ If you don't read anything else on our website but this, I would truly appreciate it. No matter where you live, keep our camping locations clean and ready for the next campers. Please. Tip 10: Forgetting that it's meant to be enjoyable! Final point and the most important point about camping – it’s meant to be fun for all. Know that it won’t be like home (that is the reason you are doing it surely? ), and that some creature comforts may not be available, the kids are going to get dirty in the first 10 minutes of arrival, and sleeping in close quarters with family members may be challenging(!!). But apart from those trivialities, remember that you are there to enjoy the beautiful outdoors, spend time with your family and experience life away from suburbia. So laugh at the mistakes (and learn from them), and don’t get disillusioned if your early camping experience is not perfection. We have lots of tips for beginners - make sure you go to look around this website, especially the "HOW TO....." page which is going to list a whole lot of stories that will interest you and give you lots more advice on beginner camping. Chances are if you have a question about camping, you can find the information on our website and blog. Watch our Slideshare presentation of these tips!